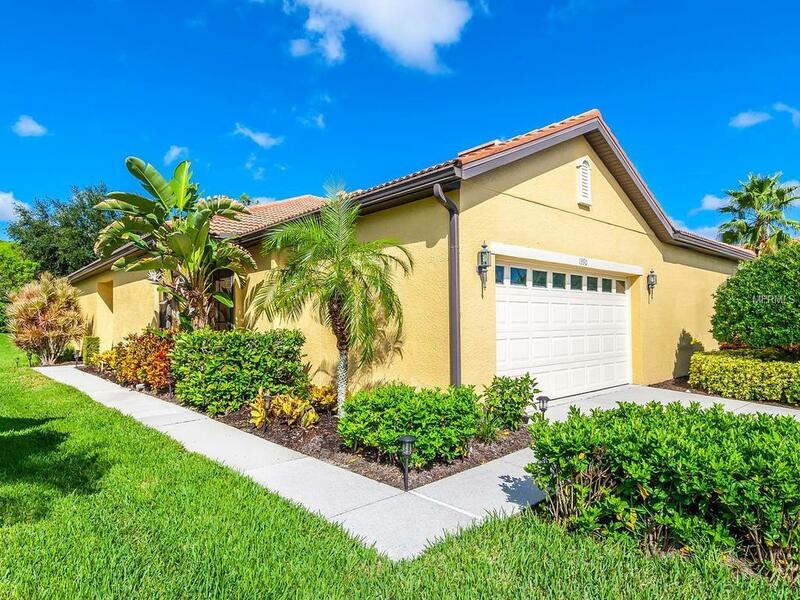 This beautiful, two-bedroom plus a den, De Medici attached villa is located in the gated, 55+ resort-style community of Venetian Falls. The home has been meticulously maintained and features an open floor plan with ceramic and porcelain tile floors in all common areas, plus crown molding. The private, extended lanai is perfect for relaxing in the sun or shade. The kitchen is designed with a separate breakfast area, stainless steel appliances, granite countertops, and a pantry. The master suite offers a large walk-in closet and a spacious bathroom with dual sinks and a beautifully tiled walk-in shower. Guests will enjoy the bedroom and full guest bath on the opposite side of the home. Maintenance-free lawn care, cable TV, and a combination of clear panel and accordion storm shutters are included. Power washing of the roof, exterior paint, and mulch are also provided on rotational schedule. The fabulous community amenities include a heated lap pool, spa, resistance walking pool, exercise facility, bocce ball, an active clubhouse with activity director, and more. All this is just a few minutes away from Gulf of Mexico beaches, shopping, restaurants and historic Main Street Venice.